Cincinnati Reds player Brantley Bell, left, signs baseballs for Emerson Climate Technologies employee Jim Duncan, of Sidney. Duncan got five baseballs signed for his family members while Reds players visited Emerson on their North Caravan Tour, Friday, Jan. 18. SIDNEY — Members of the Cincinnati Reds baseball team were in Sidney, Friday, Jan. 18, to visit with employees of Emerson Climate Technologies. 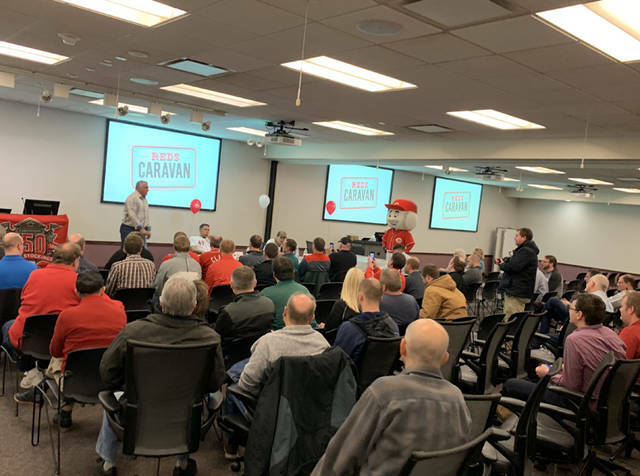 The team included the firm as a private stop on its 2019 Reds North Caravan Tour. 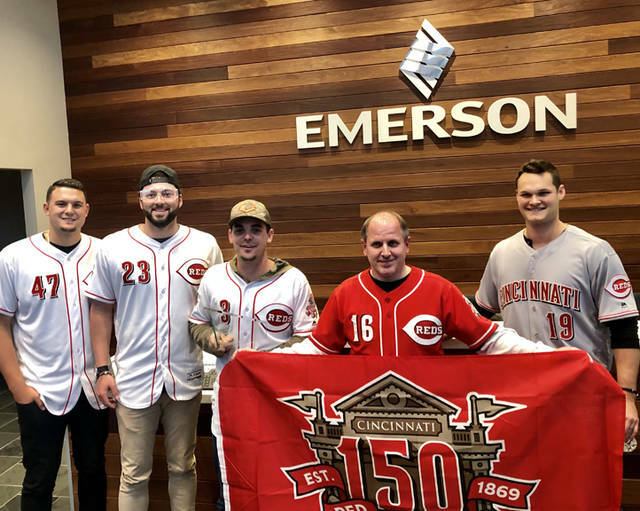 Emerson employee Jeff Clark had submitted a request to the Reds to include Emerson in the tour, citing that the company has purchased game tickets for many years. “It was pretty neat the way it worked out,” said Katy Zimpfer, senior human resources generalist at Emerson. 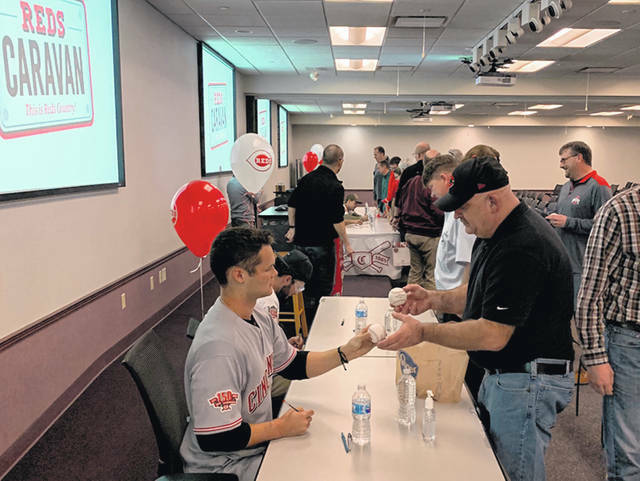 Brantley Bell, pitchers Sal Romano and Cody Reed and second baseman Scooter Gennett answered questions and signed autographs for about 100 Emerson employees at the end of the workday. “Emerson was honored to be selected as the private stop on the Red’s North Caravan Tour this year. It is a great opportunity for our employees who are fans to meet a few of the players, broadcasters and coaches. Emerson Sidney has been a long-term season ticket holder, and being a host for the private event at our facility is exciting. We appreciate the opportunity this provides to our employees,” said Brent Schroeder, group president of Heating & Air Conditioning. Reach the writer at 937-538-4824.